Appearance: This winter ale pours a rich chestnut color with a one finger thick light tan head. The head lasted OK and left little to no lacing. Smell: I can sum this up in one word; Christmas. As strange as it may sound this beer reminded us of the Christmas season. Mainly it smells like gingerbread, nutmeg and cinnamon. Quite spicy yet really alluring. They hit the nail on the head with the bouquet of this one. Initial Taste: Well those spices we smelled definitely carry over into the flavor of this beer. The cinnamon spiciness is almost overwhelming…quite disappointing. Once you wade through the spices you find a little bit of sweetness from the malts and a hint of nutmeg. The beer ends with a soft hoppy bite and some alcohol flavors. Thoughts: This would be one of my favorite winter craft ales if it wasn’t for the taste-bud numbing cinnamon. If you look at some of the other reviews of this beer online you will notice there are quite a lot negative reviews due the overwhelming spices. 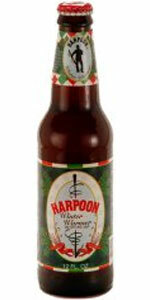 Harpoon used to use traditional spices in this beer but due to the complaints of too much sediment in the bottle Harpoon switched to liquid spices. Other brewers do not like to use liquid spices do their nature to be overly strong. Sadly the addition of liquid spices to this particular beer make the smell nothing short of fantastic but pollutes the balance of this beer making it much too spicy. However, if cinnamon and nutmeg are two of your favorite things…then it’s possible this may become one of your favorite seasonal brews. Agreed, too much spice flavor. Doesn’t retain head, nor carbonation. I don’t normally try “Holiday” or spiced beers, and this will probably keep me away from that genre for a few more years. Thanks for giving us that tidbit on the change from traditional spices to liquid spices. I absolutely used to love this beer in the 90’s back when the spice flavor was quite subtle. At some point (early 2000’s? ), the spices became overwhelming. It was very disappointing. Just tried this beer for the first time. I can see why it was marked down! Now I’m stuck with the rest of the six-pack. Horrible chemical taste, and an aftertaste that just won’t go away! I don’t see how anyone can drink this.